Bell Greek Authentic Grill strives to provide fresh and affordable Greek food to our catering customers. Bell Greek can customize any menu to fit your needs. Bell Greek does it all! Luncheons, birthdays, corporate events, social gatherings, anniversaries, weddings, and more. We offer a variety of menu items to accommodate everyone's budget. Our food is prepared daily from the freshest ingredients. Ordering: Orders can be made using the online order form below or by calling us at 804-405-6034 and asking for the Catering Specialist. Delivery and Set-up: If delivery is needed, a delivery fee may be applied based on the distance your event location is from our restaurant. Total will be provided during order confirmation. Policies: Most catering orders require at least 24 hour notice. 50% deposit may be required when placing order. Minimum of 10 required for catering orders. Vegetarian menu options available. Plates, utensils, and cups are available upon request. Review the Catering Menu below. To order, choose from your favorite menu items and hit submit. Our show stopping avgolemono soup with our signature salad. Add meat (gyro lamb, chicken, or pork) for $2.00. Slices of our delicious pita bread, with hummus and tzatziki dips. Crispy phyllo dough pastry layered with sauteed spinach and feta cheese. Crispy phyllo dough pastry layered with feta cheese. A platter of our famous pitas. Your choice of Gyro: Lamb, Chicken, or Veggie. Comes with lettuce, tomatoes, onions, and tzatziki on the side. Add a Greek Salad for $1.99 pp. One chargrilled pork skewer with Greek Salad, rice, tzatziki and pita bread. One chargrilled chicken skewer with Greek Salad, rice, tzatziki and pita bread. Pasta w/caramelized onion, marinara, mozzarella & feta cheese served with side salad and pita bread. Baklava is a rich, sweet pastry made of layers of filo/phyllo dough filled with chopped nuts and sweetened and held together with syrup or honey. Galaktombouriko is a traditional Greek dessert made with a custard in a crispy phyllo pastry shell. Melt in your mouth cookies with Confectioners' Sugar. 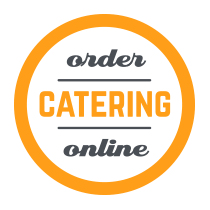 After submitting your catering order below, you will receive an email reply as confirmation that your order was accepted. This email confirmation will include a summary of your order along with a total price.